This Easy One Pot Cheeseburger Soup Recipe is a simple, easy, and delicious hearty cheeseburger soup that everyone loves! Keto/Low carb soup cheeseburger soup recipe, too. This Easy Cheeseburger Soup Recipe has quickly become one of my all time favorite meals – it is simple, uses ingredients I often already have on hand, is incredibly easy, and tastes AMAZING! 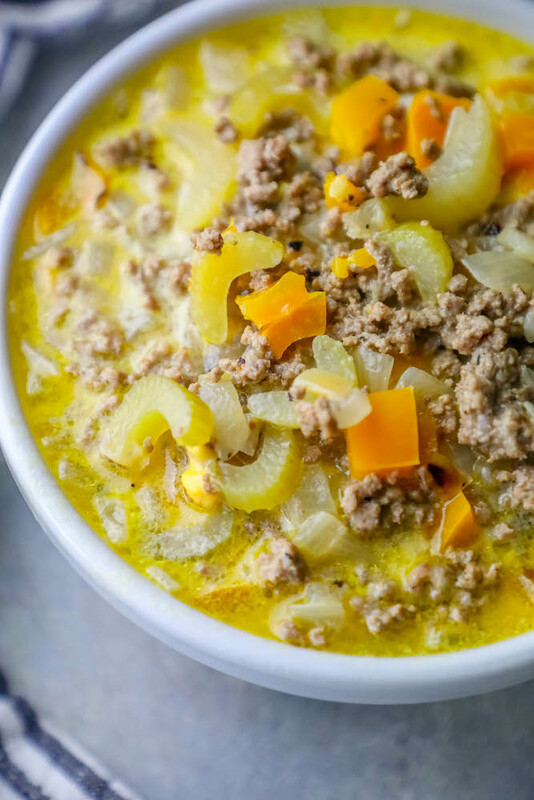 While many cheeseburger soups contain potato, I am offering up a potato free cheeseburger soup that is loaded with fresh vegetables and a ton of delicious ground beef – plus tons of cheesy flavor. 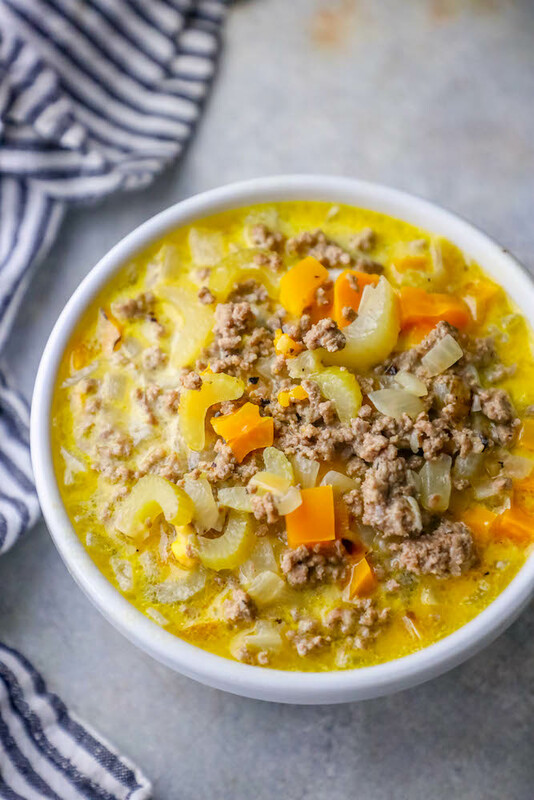 Cheeseburger soup is one of those things that brings a ton of comfort in fall – it is perfect for watching the game, family dinners, or just lunch on the go! Just take me to the Easy Cheeseburger Soup Recipe Already! If you want to skip my helpful tips and tricks and similar recipe ideas, please scroll to the bottom of the page where you’ll find the easy printable cheeseburger soup recipe. I added a lot of information to this post because I get a lot of questions on recipes, so I try to give a ton of info to make sure you love it! If you’ve wondered how can I freeze cheeseburger soup, you’re not alone! 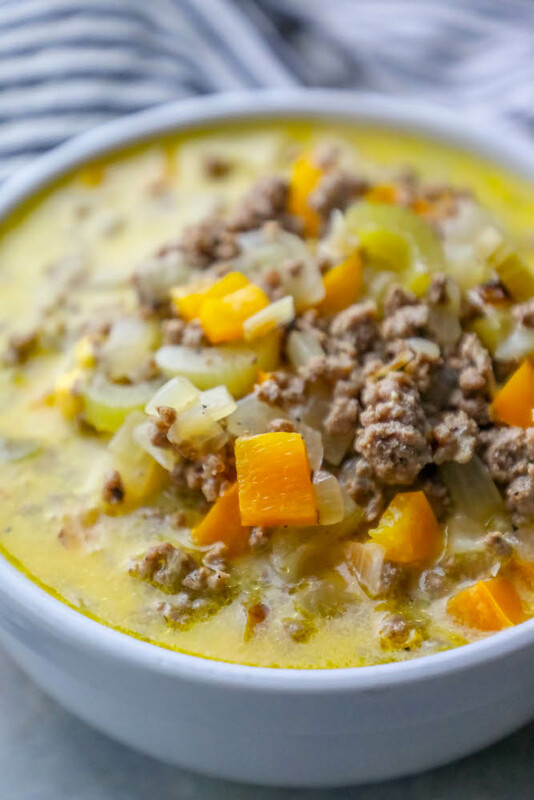 Cheeseburger soup is one of those dishes that is perfect on a cold night or a stressed weekday when you just need to tuck into something hearty and comforting. Let cool and add to a ziploc bag, with any extra air bubbles squeezed out. 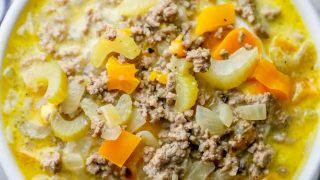 You can freeze cheeseburger soup for up to 6 months if you used fresh ground beef that had not been frozen before cooking with a couple easy tips! First off, do not mix in sour cream to soup if you’re going to freeze it – wait to add it in later when reheating! Let the soup thaw overnight in the fridge. Add to a soup pot and bring to a boil – or microwave to piping hot. If soup thins out, or you’d like a little more creamy goodness when you reheat soup, you can add in a dash of cream and whisk it into the soup, plus 1-2 more ounces of velveeta or shredded cheddar cheese – simply stir them into hot soup and let them melt before eating. 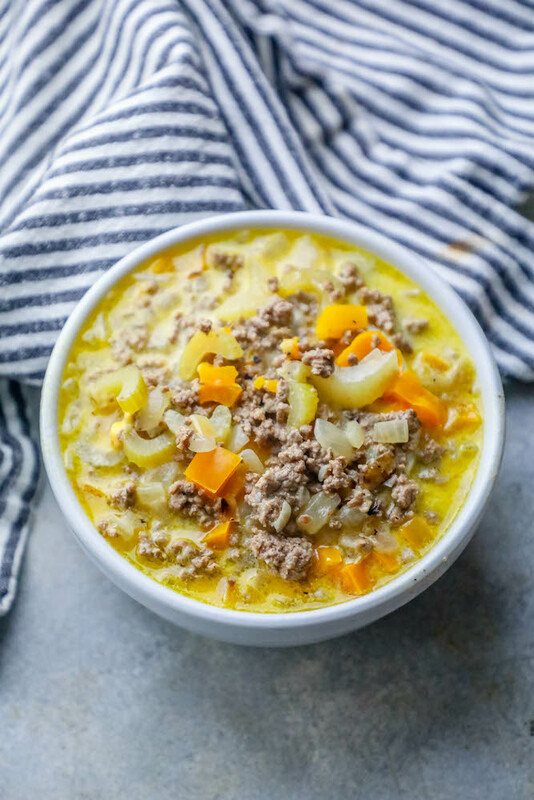 This easy cheeseburger soup can easily be turned into a keto cheeseburger soup recipe – with just one swap. 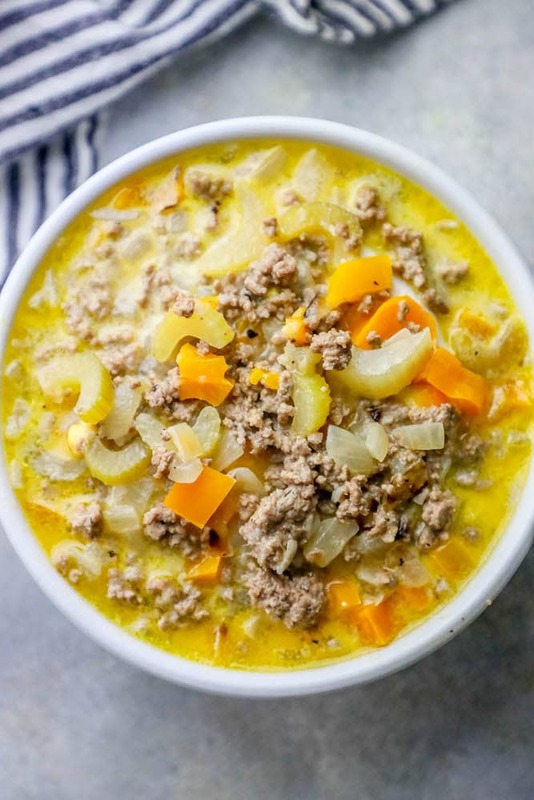 I am calling for velveeta cheese in this cheeseburger soup (which, yea, is heavily processed) – making it not the healthiest choice, and adding processed food into the recipe. To make this soup keto/all natural, simply swap the velveeta for a nice melting cheddar (or a cheddar-mozzarella mix) of shredded cheese. I prefer the easy creamy texture that velveeta gives this soup, but it is just as flavorful with unprocessed cheese. While cheese is amazingly delicious in soup, it isn’t the easiest ingredient to incorporate to soups and stews – since it can clump and separate from the soup, leaving you with a gross and sticky mess. To prevent clumping cheese, follow my handy tips below! If using velveeta, as the recipe calls for, you can be a lot less precise – that stuff can take pretty much anything and still come out creamy, smooth, and perfect in a recipe. If using a non-processed cheese, following these tips will help ensure your soup is a creamy, dreamy masterpiece! Cheeses with a higher moisture content incorporate much better into soups – whereas drier cheeses tend to clump up more. Add cheese by gradually sprinkling cheese over soup, and stirring well to melt and mix cheese, before adding the next handful. If adding too much cheese too quickly to a soup, cheese is more likely to clump and seize up without fully incorporating. Cheese’s proteins break down over high heat, and can force the cheese to “seize” up, release all it’s moisture, and clump. If you love this easy and delicious one pot cheeseburger soup, you won’t want to miss some of my other favorite easy soups! Click each link to go to the easy printable recipe. Instant Pot Skinny Steak Soup – Just 3 Points! If you love the easy one pot cheeseburger soup recipe, please give it five stars and help me share on facebook and pinterest! In a large saucepan over medium heat, melt 1 tablespoon butter over medium heat. Add ground beef - cook and crumble beef until no longer pink. Add in vegetables to brown with beef. Saute beef, onion, carrots, celery, basil and parsley until vegetables are tender, about 10 minutes. Stir in cheese, milk, salt and pepper; cook until cheese melts. Remove from heat; blend in sour cream. Very good. Added 2 gloves of garlic and it was delicious! This is perfect for my kids! They love cheeseburger soup! I was looking for some great soup recipes! Thank you! My boyfriend loves soup and cheeseburgers! I’ll have to make this for him someday – I just know he’d love it! My family would love this recipe! SO yummy! This soup looks absolutely delicious! Yummy! I love cheeseburgers and I love soup – so this is a must try!